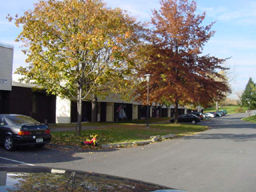 The Beman Lane RAHP Apartments are two-story apartments with front and rear private entrances. Each apartment totals 1,000 square feet. Living room, dining area, kitchen, and closet are on the first floor. Three bedrooms, a bath with a double sink, and a storage closet are on the second floor. The bedrooms are two smaller single rooms and one large double occupancy room. Living and bedroom areas are carpeted. All other rooms are tiled. Kitchens are equipped with electric range, and refrigerator. All rooms are heated electrically by individually controlled baseboard units. Click here for floor plan information.